"The Giving Reef” acknowledges our most generous supporters who donate $500 or more. The Giving Reef is located at Headquarters in Key Largo, FL. 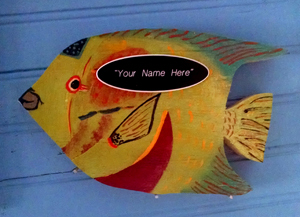 We hand paint each fish, which features the donor’s name on a plaque. Each fish is displayed on the fence from September until the next Fall. Donors will receive a photo of their fish via email, and each fish will be based on giving levels: $500-Jack; $1,000-Angelfish; $2,500-Grouper; and $5000-Shark. These are REEF's generous donors who contributed from September, 2017 to September, 2018.